Laura Antoine Lhqumtunaat is a Hul’q’umi’num’ language and culture teacher for Cowichan Valley School District 79. Raised in a traditional family, she brings a deep respect and seriousness to her cultural practice. Her stories convey spiritual values in an accessible and interesting way. Her work is an inspiration to the younger generation. Valerie N. Bob Suli’xwi’ye is from Hwtsusi, a part of the Penelakut Tribe. Her roots are from Sammy Bob (Old Bob) from what is now Penelakut Island. Her father Francis Bob was born at Quamichan. Valerie grew up at Hwtsusi and is the proud mother of three and grandmother of five. She is a teacher, artist, and musician, and is currently a PhD student at Simon Fraser University studying language and music. Joan Brown Quwqumalwut is a project producer and language strategist. 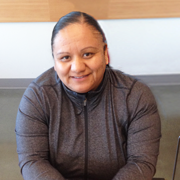 She is currently working at Coast Salish Employment & Training Society and finishing her MA in Language Revitalization at the University of Victoria. 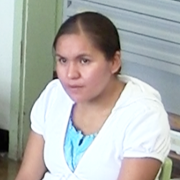 Sonya Charlie Lushiimtunaat is a busy mother and linguistics student. Her parents are Darlene Sylvester Sunatiye’ and Arvid Charlie Lushiim, from whom she learned a love for her language and the importance of her cultural heritage. 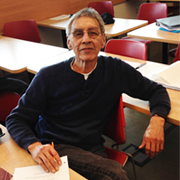 Harvey George S-hwuts’tus is a Hul’q’umi’num’ language and culture teacher for Cowichan Valley School District 79, who brings a rich cultural foundation and a great sense of humor to his teaching. 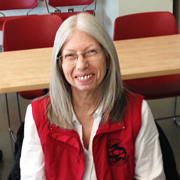 Donna Gerdts, professor of linguistics at Simon Fraser University, has studied the Hul’q’umi’num’ language for forty years, and hopes her work honors the Elders who have shared their knowledge. She wears the honorary name Sp’aqw’um’ultunaat. 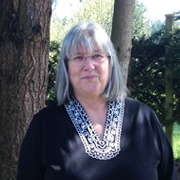 Sally Hart, a teacher for Cowichan Valley School District 79, lives beside Quamichan Lake with her husband Roger. Her father is Dodie (George) Barker from Pun’eluxutth’ and her mother the late Adelaide Lapp from the town of Chemainus. Sally is dedicated to her family and several grandchildren. Her on-going educational focus is the Hul’q’umi’num’ language and culture, and she especially enjoys creating art for stories and legends. Carol Louie Tth’ets’sulwut is from Xwul’qw’selu. Her mother is Donalda Louie Sla’quliye’ and her late father Francis Louie Xutth'xutth'uluq. 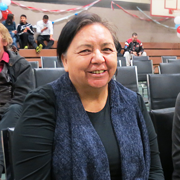 She is a Hul’q’umi’num’ language teacher for Cowichan Valley School District 79. She brings traditional values and artistic abilities to her stories. 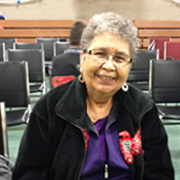 Delores Louie Swustanulwut was raised speaking Hul’q’umi’num’ in Quamichan. 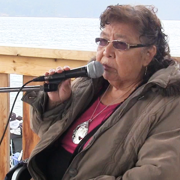 She has lived in Stz’uminus First Nations since marrying her late husband Percy Louie. She is an Elder in Residence at Vancouver Island University as well as a teacher in the SFU Hul’q’umi’num’ language program. She is currently doing research on several projects, including the traditional use of plants, and she is actively engaged in producing Hul’q’umi’num’ language learning materials for the future generation of teachers. Ruby Peter Sti’tum’at is from Quamichan. 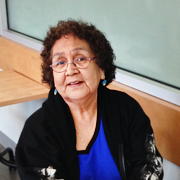 Growing up speaking Hul’q’umi’num’, she has worked as a translator, researcher, and teacher of her language for over seventy years. Currently she is working on several research projects as well as teaching for Simon Fraser University and Cowichan Tribes. The author of many stories herself, as well as being an expert teller of traditional stories, she was very glad to mentor the Hul’q’umi’num’ language teachers in producing stories. 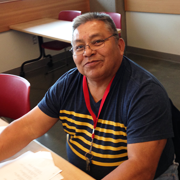 George Wayne Seymour Squtxulenuxw is from Stz’uminus First Nation. 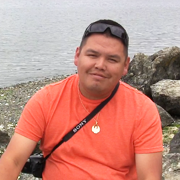 He is a student in and teacher for SFU Hul’q’umi’num’ language courses, and he teaches language and culture for Cowichan Valley School District 79, when he’s not busily engaged in carving, smoking fish, and other traditional pursuits. He has been very glad to bring out some of the stories that he heard as a child so that the younger generation can enjoy and learn from them. Claudia Sylvester (aka Peanuts) is from Xwul’qw’selu. Her s-hwulmuhwa’lh sne is Siya’mulwut. Her grandparents are the late Wilfred and Sarah Sylvester. Her parents are Darlene Sylvester Sunatiye’ and Arvid Charlie Luschiim. She is a Hul’q’umi’num’ teacher at Chemainus Elementary, Chemainus Secondary, and Crofton Elementary. Dolly Sylvester Hohwulenuhwtanaat is from Xwul’qw’selu. 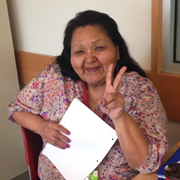 She is a Hul’q’umi’num’ language teacher at Alexander School where she teaches grades K–7. She has inspired many generations of students to do their best in learning their language. 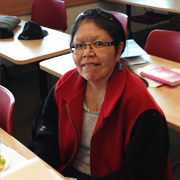 She is a student in and a teacher for SFU Hul’q’umi’num’ language courses.